Love is immortal at the Dyer Memorial. After the death of his wife, Betsy, in 1956, Clifton Dyer erected a monument in her memory. Its commemorative plaque reads, in part, “…as a permanent tribute to her for the never-failing aid, encouragement and inspiration which she contributed to their married career…” Now you, too, can create a lasting tribute to a loved one on the same site. The Dyer Memorial Forest is a new initiative by the site’s caretakers, the Muskoka Conservancy. “We wanted to revitalize the property plus it’s such a special place that we thought it would be a neat idea for people to remember someone with a memorial tree,” says Claire Danes, Communications and Events Coordinator for the Conservancy. At an information session at the Dyer Memorial Nature Reserve on Sunday, August 30, interested people can learn more about the initiative and choose a site for their own memorial tree. “People can buy a tree to remember someone or a special event, or they can even participate if they just want to be part of the memorial,” says Danes. Those who purchase a tree can choose from two species – Red Oak or Sugar Maple – and will be able to select a location for it to be planted at several sites on the property. Those species were chosen after consultation with experts, says Danes. The Conservancy wanted to diversify the forest, which has a heavy concentration of pines, by planting native species that are easy to plant and will grow well at the site. Trees will be planted during a special ceremony on Saturday, September 19. 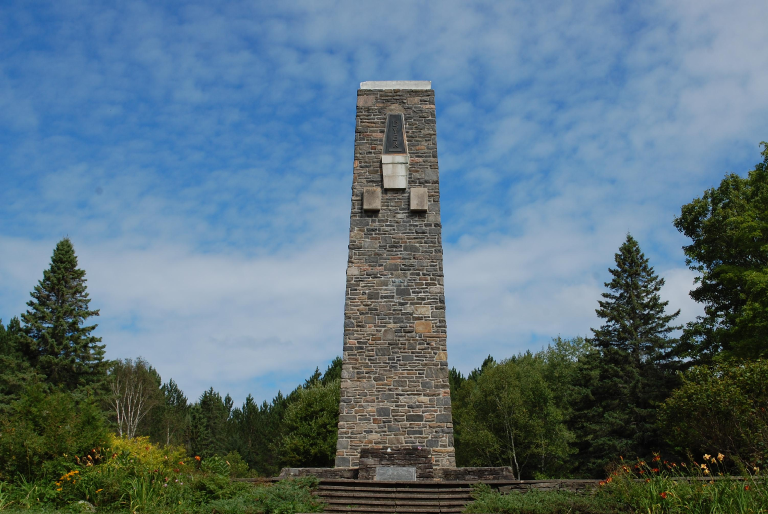 The forest will also serve as a fundraiser for the Muskoka Conservancy, the site’s caretakers – funds raised will help to maintain the Dyer Memorial property. The Conservancy hopes to make this an annual or even a bi-annual event if it proves popular. Very beautiful place. The energy of it is so powerful. Visited with my son. We both loved it. We visited the monument this past weekend, Thanksgiving. What a beautiful place of quietude and peace. It is a lovely drive into the site, especially in autumn with the changing colours. What, though, is the reason someone has erected a crude, blatant sign on the right of the roadway just before the monument? Is there any way this person can be convinced to take down this sign?to those who maintain the monument, thank you very much! It would be nice if you could actually get to it. Tried this weekend and the roadway was blocked by a backhoe. Who owns this and how can someone be able to block a road?!!! !